Once again, and as I've said in another thread, just loving these darn things, Murd! Thanks again!!! Hearing these read aloud is a nice reminder of how much fun the original writers of the OHOTMU must have had when they made it. And, also, how often they would just punt on height and weight. As just about everyone seems to be 6ft and 180lbs. LOL!!! That gave me my morning laugh! I love these posts. Keep them coming. I love the compact little doses of Murdosity! it is easier to get forgiveness than it is permission. 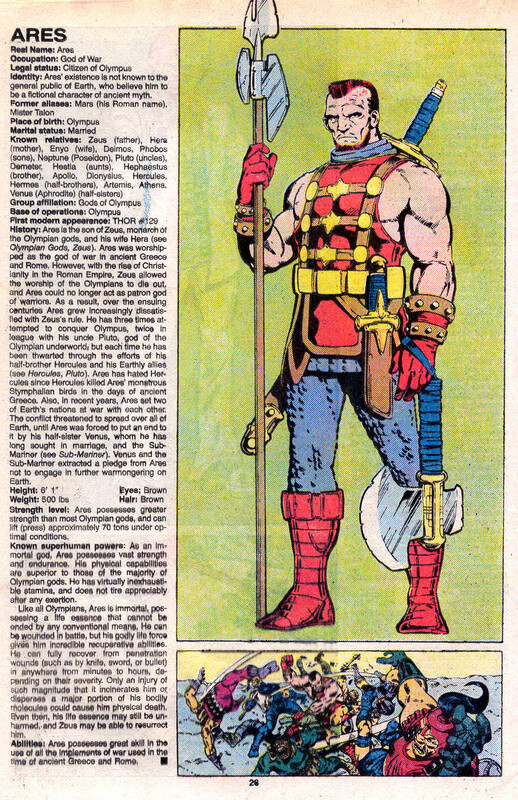 Love that great Paul Smith drawing of Ares. I love it. Great idea and execution.. I don't see why the same people who told me it was taboo are here heaping praise on reading comics on the air and hoping it can "fly under the radar". I personally don't actually see anything wrong with it, but I didn't see anything wrong with linking to a scan of Steranko's OUTLANDER adaptation, either. I was curious, since you have brought this up a few times now. For context, here is the conversation that @Tonebone is talking about. You can judge for yourselves, but I would say "lambasted" is a little strong. Everyone who took issue with the links to scan sites, to my reading, seemed like they were being polite. They questioned, rather than accused. No one said anything negative about you personally or your motives. And it is not like the thread even got deleted. It is still there, and easy to find on a search of your discussions. They basically just said, 'we should be careful about this'. And they actually aren't the same people praising the MOHOTMU episodes in this discussion. In fact, in the case of @nweathington‌ , he is saying the same thing here, that they should be careful about this. I would encourage you to follow the link and take another look. I feel like your recollection of how you were talked to by people about this may be more negative than what is actually there on the thread. I didn't remember having brought this up, before, but sure enough... I have. I just had a bad day, and I think I just wanted to be sour. Fair enough. And thanks for admitting it was that. Sorry about the bad day. sorry. i'm going to bed now. My cell phone has more memory than both Avengers Mansion computers combined. In fact my phone has almost 3X the amount of "HP's experimental large memory-whatever" computer..funny stuff. Enjoyed "Editorial". I remember reading that and saying to myself " That's why Marvel is better than DC". DC got better post Crisis but I was a certified Marvel Zombie then and that rationalized it for my teen brain. The Appendix to Issue #1 kept giving me a start every time that loud "PING" would play for a topic change. I support this. I would love for the MOHOTMU to be on a separate feed. I found it to be too much as well since the shows are automatically downloaded. I only listened to the first few before giving up on it. So I've since unsubscribed to the podcast. I now download just the main episodes manually. But without the automatic download, I know I've skipped a few eps here and there lately. That's probably not what the Geeks want to hear but it was the only way to stop filling up my queue. 5 extra episodes a week that run for about 3 minutes each isn't an unmanageable burden to me. Well now that is official that MOHOTMU is no longer on the main feed, as an iTunes user where do I find the new MOHOTMU's? I've looked and can't find it tonight. I checked with Bryan and he said that it may take a while for iTunes to update to the new feed and that you can manually add the RSS feed into iTunes. These are great, but @Adam_Murdough‌'s reading of the Black Cat was the first time I thought of Felicia & felt turned off! Have you checked your subscription settings? Make sure you are set to download all episodes. I'm still running iTunes 11 because they screwed up the way podcasts work in the newer versions. Personally, I prefer the MOHOTMU on it's own feed. Are all the entries Murd has done so far going to be added to this feed?